The Makeup Box: Coastal Scents Blue-Red Chrome Mica: MAC Cornflower Pigment Dupe? 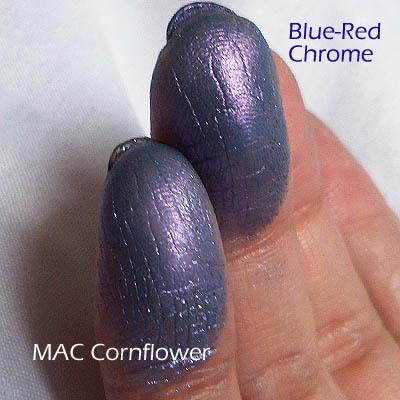 Coastal Scents Blue-Red Chrome Mica: MAC Cornflower Pigment Dupe? As you can see from the swatches, not really. BUT if you've ever wished that MAC's Cornflower was a little stronger, finer-grained, and looked as duochrome on the lid as it does in the bottle, then this actually performs better for a whole lot less. The only thing you need to watch out for is to wear a good base or primer on your lids, because pure micas don't stick very well and can fade or dust off quickly. This shade is no different. Here's a close-up of the 2 swatches over a clear base. (Both pigments don't stick all that well.) As you can see, MAC Cornflower goes on blue with just the faintest trace of violet overtone, but once it's swatched next to Blue-Red Chrome, it looks flat-out periwinkle blue. Blue-Red Chrome on the other hand, shifts very beautifully between blue and a mauve-violet. 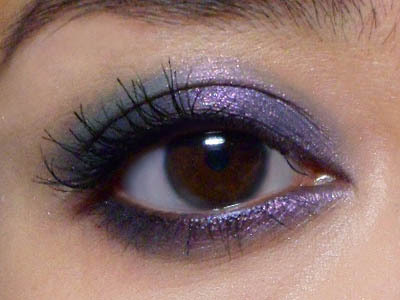 If you apply it without a base, it goes on very sheer with a violet sheen. For about $1 a sample baggie, this is again something I would recommend you check out OVER a MAC pigment. Step 1: I applied a dark blue pencil (MAC Blooz Kohl) along the lash line and diagonally up across the upper lid almost like a wing, but not extending much past the outer corners. 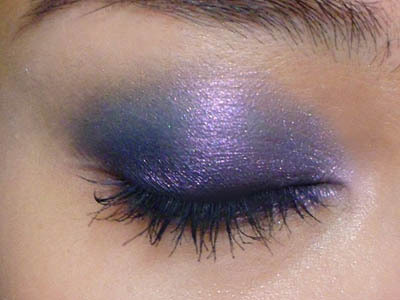 This will serve as a dark base, which is ALWAYS a great way to bring out duochrome colors. Step 2: Use your fingers to just lightly smudge and smoke the outer edges. Step 3: Using a flat shadow brush so I can minimize fallout, I packed the pigment over the entire lid, from inner to outer corners, up to the socket line. Then I ran the brush along the lower lash line as well. Step 4: Just curl lashes and apply mascara to finish! Beautiful look, Love the shimmer! <3 Both pigments are amazing!